A premium experience for an affordable price. 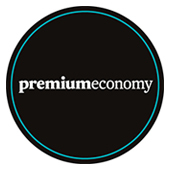 If you want all the benefits of premium travel at a great price, choose Premium Economy. You'll get two priority checked bags (up to 23kg each) and two carry-on bags (up to 7kg each). You'll also enjoy a luxury leather seat with more personal space and delicious modern cuisine from our Premium Economy menu. Plus there's full access to inflight movies, TV, music and games from gate-to-gate. Premium Economy fare is only available on Air New Zealand operated flights.